Now, stumbling across this was pretty amazing. 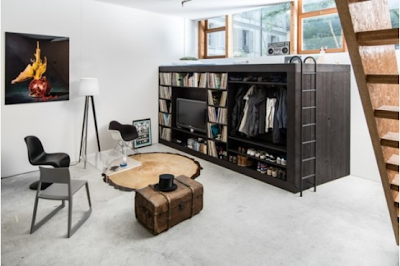 It looks like this guy designed his own storage system to fit within his small apartment* to hold his tv, clothes, shoes, vinyl records, and an extra guest bed up top. Here you can see how big the cube is in relation to the designer, as well as possibly watch him enter the magical land of Narnia. I think this is an incredible design that fits a lot into a small space, however, I feel he could get even more storage accomplished if he got rid of his RECORD COLLECTION and moved onto DIGITAL MP3s like the rest of the US. I understand some people like vinyl for its retro feel and are even happy with the authentic scratchy sounds while you are playing music - but let's be reasonable when you have such limited square footage! 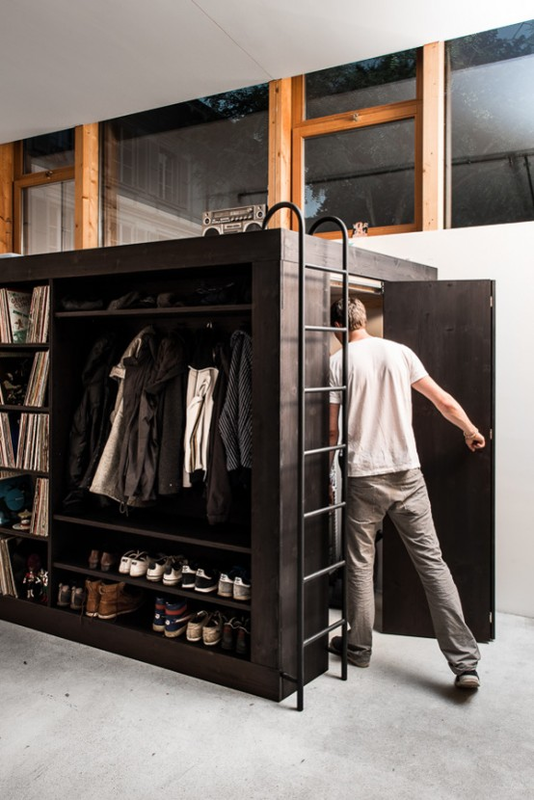 *I think this storage cube is about the size of half my apartment so I am using his "small space" with an asterisk. I also have no idea how you could ever move this anywhere else, so perhaps this is a permanent piece of furniture in the apartment.